Shakuntala Devi was the most famous mnemonist of India who could perform long and complex mathematical operations mentally. Due to this singular prodigious talent, she was popularly known as the “Human Computer”. Her talent earned her a mention in The Guinness Book of World Records. She was also an accomplished author and wrote a number of books, including novels as well as texts about mathematics, puzzles, and astrology. Shakuntala Devi was born on 4 November 1929, in Bengaluru, Karnataka, to an orthodox Kannada Brahmin family. Her father, instead of following the family tradition of becoming a temple priest, chose to work in a circus as a trapeze artist, lion tamer, tightrope walker and magician. When Shakuntala Devi was just three years old, her father discovered her ability to memorise numbers, without having any formal education. Her father began displaying her ability at calculation in road shows. When she was six year old, she demonstrated her arithmetic abilities at the University of Mysore. 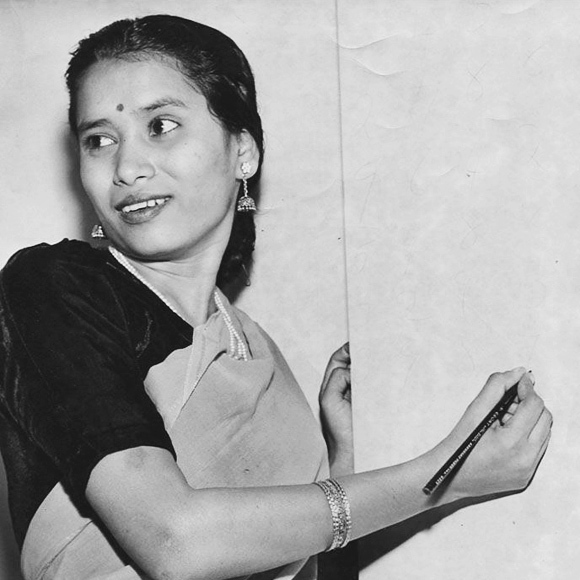 In 1944, Shakuntala Devi went to London with her father. She travelled the world demonstrating her mathematical talents. She toured Europe in 1950 and America in 1976. In 1977, she gave the 23rd root of a 201-digit number in 50 seconds. This event took place at Southern Methodist University. Her answer was confirmed by the US Bureau of Standards; which used a specially programmed UNIVAC 1101 computer, to handle such a large calculation. In 1980, she mentally multiplied two randomly picked 13-digit numbers and correctly answered it in 28 seconds. This demonstration was done at the Computer Department of Imperial College London. This event was recorded in the 1982 Guinness Book of World Records. In 1988, she went to the US to have herself tested by Arthur Jensen, at the University of California. Her performance was tested on several mathematical tasks involved with the calculation of large numbers. She easily provided the solution to problems which included calculating the roots of huge numbers. These findings were published in the academic journal Intelligence in 1990. Shakuntala Devi wrote a book ‘Figuring: The Joy of Numbers’, which is still a bestseller. In her book she explained many of the methods she used for her mental calculations. She has also written cookery books and a novel. In 1977, she wrote The World of Homosexuals, which is considered as the first study of homosexuality in India. She was considered a pioneer in this field and treated homosexuality in an understanding and empathetic way. The book called for decriminalization of homosexuality, and full and complete acceptance, not just tolerance and sympathy. When she returned to India in the 1960s, she married Paritosh Banerji, an Indian Administrative Service officer from Kolkata. They later divorced in 1979. She has a daughter, Anupama Banerjee. In 1980, she also contested for the Lok Sabha elections from Bombay South and Medak, in Telangana. At Medak she stood against Mrs. Indira Gandhi, and lost from both the constituencies. She was also an astrologer. In April 2013, Shakuntala Devi was admitted to a hospital in Bengaluru. For two weeks she suffered from respiratory problem, and later from complications of the heart and kidneys. On 21 April 2013, she died in the hospital at the age of 83 years. The same year, on her 84th birth anniversary on 4 November, Google honoured her with a Doodle. Shakuntala Devi was not just a mathematical genius but also a great philanthropists who helped the poor students and especially the girl child. Born in a poor family and growing up in the slums, she was very sensitive to the poverty and deprivation amongst poor children. She was also a mathematics evangelist and played a big role in making mathematics popular and interesting for students. She wrote several books to help students develop a keen interest in mathematics and understand it better. Through her “Shakuntala Devi Education Foundation Public Trust” she made education accessible to underprivileged children. More than being a Human Computer, she was a very compassionate human being and a truly inspirational celebrity.